Codeword puzzles are one of the most popular word puzzles, and typically appear in a wide range of publications, including many daily newspapers. 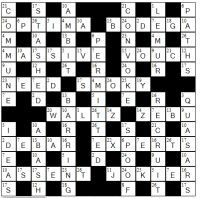 Although described as a crossword variant, the codeword puzzle solves very differently to a crossword. Indeed there are no clues at all in a codeword puzzle which is of course the main feature of a crossword puzzle. With a codeword puzzle each letter of the alphabet from A - Z appears in the solution grid at least once. And each letter has been substituted with a number from 1 - 26. The aim of the puzzle is to work out which letter has been replaced by each number, and therefore slowly solve the puzzle. The key thing to remember is that every letter from A - Z appears and that each number from 1 - 26 stands for just one letter. So if you work out that '1' must be 'E' then you know that EVERY instance of the number '1' can be replaced with 'E' in the grid. Solving codewords can be tricky, and of course requires a good knowledge of English and also plenty of practice. Key to solving the puzzle is to use the hint letters given to help get you started. Then you need to know a thing or two about letter frequencies. Many people like to start by trying to work out where the 'E' goes. As 'E' is the most common letter in English, it is often the case, but not always, that the number that appears the most times in the grid codes for the letter 'E'. However it could be another of the most common letters, such as 'T' or 'A' and, rarely, other letters too. When solving codewords, which are also known as other names such as code breakers, it helps to use your knowledge of letter / vowel patterns in English, knowledge of double letters, and also patterns that are common such as words ending in 'ING' or of course plurals ending in 'S'. As well as things like knowing 'QU' virtually always appear together. In order to be fair, codeword puzzles you find on this site will use barely any proper nouns, we just use country names on occasion. This is because many people get frustrated thinking they have made mistakes when the answer is a proper noun, and admitting proper nouns as eligible massively increases the number of possible words that are valid, and depending what you think is a fair proper noun (major cities only, any city anywhere in the world) then it can make the puzzles unenjoyable and lead to multiple solutions too. We hope you find our codeword puzzles enjoyable!